Designed for Weak Signal, Tropo Scatter, Meteor Scatter, Digital, & Contest Operation! tradition. It’s sleek blue anodized front panel is a show stopper. Due to its small foot print and light weight, the HLV-1250 is the ideal amplifier for: contest, portable, EME & home station operation. VDC cable, the sequenced voltage is available via a back panel connection. new Beko HPP-144 2.5 kW mast mounted preamplifiers. * Extremely light weight 23 lbs. All Beko amplifiers are VSWR, Overdrive and Temperature Protected. 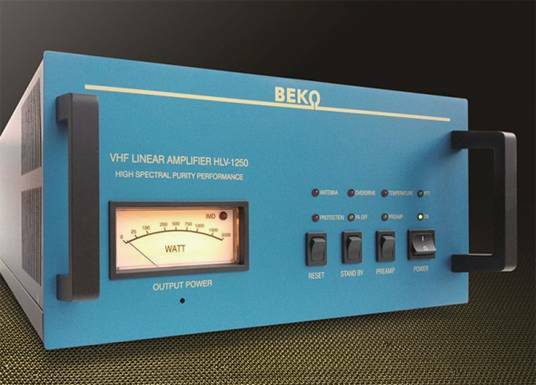 BEKO amplifiers are “the best of the best” VHF UHF & SHF high-power linear amplifiers available worldwide! Factory Authorized Service and Sales Center for USA, Canada & SA. Designed to interface with low power SDR’s. Switchable from Low power RF Drive Levels to Standard Drive levels at the flick of a switch. for use with low RF output drive level SDR Transceivers such as the popular FlexRadio Systems FLEX-6700 series. (2.5 mW – 65.0 mW). to set the appropriate low level RF drive for full RF output power. As part of SSB Electronic USA & Beko Elektronik’s policy of no obsolescence, a rear panel switch allows the user to switch between low power drive as well as the standard higher power drive levels of 5 – 25 watts specified at time of order. All the Beko Elektronik Amplifier standard features such as: Integrated Power Supplies, Overdrive, VSWR, temperature protection, as well as an integrated multi-level sequencer to allow external preamplifier control and voltage feed via the coaxial cable or via a separate feed to interface with the new Beko 2.5 kW series of Mast-Mounted Low Noise Preamplifiers. * Full output with +4 to + 18.0 dBm (2.5 mW – 65.0 mW) switchable to the standard ordered drive level placed at time of order.